…hopefully i’ll be able to upload photos and stuff while in niamey. this is just a test to see how to do it. 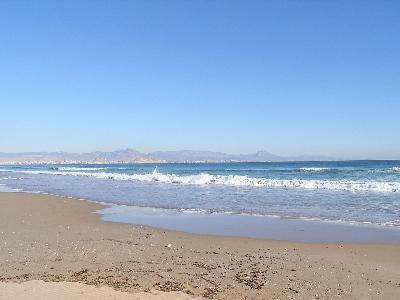 this beach is in spain, where chris iwll be when i’m in africa. This entry was posted in west africa august 2006 by civiltalker. Bookmark the permalink. Hey Michelle and Chris – really liked the metamorphosis that took place on your home. Maybe now I can give it a royal visit – although not whilst you’re in Niger and Spain, that would just be spooky! Hey that leather sofa is cool, I hope it’s also comfortable. And i like the plants that you have on the roof of the boat. In fact your boat reminds me of the house boats that I admired in Amsterdam.